Posted by Dr. Z Bulbs in Uncategorized. Wowie Zowie! Its me, Dr. Z! The pharoah of fluorescent and lord of light! More and more researchers are finding that light can be to help the elderly in variety of ways(depression, sadd, seeing..) This recent article shows how light can be used in helping sleep troubles. So Read On! TROY, N.Y.—At 100 years old, Katherine Closson hardly sleeps like a baby. She often waits until 11:30 p.m. to go to bed, then listens to classical music until she falls asleep around 12:30. Five hours later, she is awake. “I’m going to get a job as night watchman here,” jokes Ms. Closson, who lives in an assisted-living facility in this city outside of Albany, N.Y.
A few miles away, researchers at Rensselaer Polytechnic Institute are searching for practical ways to alleviate the sleep troubles that plague many elderly people by adjusting the lighting where they live. Difficulty with sleeping can contribute to overuse of sleep medications. Rensselaer Polytechnic Instistute Researchers are testing if blue light can help regulate sleep. Mariana Figueiro, the director of RPI’s “light and health” program, is looking to apply research about the relationship between light and the 24-hour internal body clock, known as circadian rhythm. This rhythm tells us when to sleep and awaken and helps coordinate many bodily functions that operate on daily cycles. For older people, extended time spent indoors and the effects of aging on the eyes and the brain can cause the circadian rhythm to get out of whack. Researchers are focusing on sending signals to the brain by means of light to keep the body’s circadian rhythm in sync with the rising and the setting of the sun. For this purpose, there’s strong evidence that the eye is most responsive to light at wavelengths that appear to us as blue. Light that we see outdoors tends to have more blue in it, whereas light from a typical incandescent light bulb has more red tones. There are skeptics of blue light’s impact on sleep, and more tests are needed to establish the connection to sleep and the timing that is most effective for different people, Dr. Figueiro says. Her research team works out of RPI’s Lighting Research Center, which conducts an array of tests ranging from measuring the glare of an automobile headlight to calculating the energy efficiency of different light bulbs. Dr. Figueiro, a 40-year-old native of Brazil, trained as an architect before earning her doctorate in multidisciplinary science. For its work on sleep and the elderly, RPI has received funding from the National Institutes of Health, groups such as the American Institute of Architects and through donations of equipment from lighting makers. As people age, they tend to take longer to fall asleep, and they sleep more lightly and awaken more often during the night, says Philip Sloane, a geriatrician at the University of North Carolina at Chapel Hill, who is working with RPI on research on sleep and aging. Patients with Alzheimer’s disease often have such “chaotic” sleep rhythms that they commonly may be asleep in the middle of the afternoon and awake at 1 a.m., he says. Others in the field include the Netherlands Institute for Neuroscience, which published a multiyear study last year in the Journal of the American Medical Association showing that placing bright white lights in common living areas resulted in a moderate improvement in sleep patterns of 189 elderly study subjects, most with dementia. Dr. Figueiro has worked with small groups of older people in each of her experiments. In the earliest such test, in 2002, Dr. Figueiro placed four boxes containing light-emitting diodes, some blue and some red, on tables in a local nursing home’s community room. Four Alzheimer’s patients sat there for two hours each session, spending some sessions exposed to the blue LEDs and others exposed to red or no LEDs. After they retired for the night, nurses checked on them every two hours. Participants who had been exposed to the blue light were asleep during these checks 66% of the time. That compared with 54% for participants who had been exposed to red LEDs. In a later experiment, Dr. Figueiro used light bulbs that emitted a white color with a blue tint, imitating daylight. She didn’t expect the light to affect circadian rhythm as effectively as purer blue light, but the bulbs can easily be used in home lamps. Dr. Figueiro says four elderly people with sleep problems, but who weren’t Alzheimer’s patients, completed the study. They showed improvement in their sleep quality as measured by a device that monitors wrist movement, an indicator of the body’s rest and activity patterns. The 100-year old Ms. Closson, one of the participants in that experiment, says she isn’t sure whether her sleep improved. But she still uses the blue-tinted bulbs, including in a lamp over the green armchair where she reads. “It’s a beautiful light,” she says. Recently, Dr. Figueiro has experimented with a new technique. 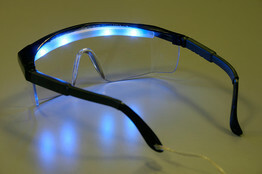 She used battery-powered blue LEDs on the top edge of safety glasses that patients could wear for an hour or two a day. A preliminary study with 11 subjects showed that the light suppressed their levels of melatonin—a naturally occurring hormone that is produced at night—suggesting that the glasses could help regulate the body’s clock.